(Denver, CO) – HomeSlice Artist Management, exclusive management firm for Chancey Williams & the Younger Brothers Band, announced this morning that the rising country music star has entered into a multi-year endorsement deal with CINCH® Jeans & Shirts. Jessica Wahlert, Marketing Manager for CINCH®, said she and her team are enthusiastic about the deal. “We’re excited about the synergies in this partnership including authenticity and passion for the western way of life. Chancey’s commitment to country music fans and the entertainment business is an easy pairing with CINCH’s pledge to stay true to its core western lifestyle customer.” Wahlert described the deal as comprehensive and multi-platformed. Fans of Chancey Williams & the Younger Brothers Band can expect to see even more of the CINCH® brand at the shows and on the tour. Similarly, CINCH® customers will soon see Chancey Williams images online and in-store. The company, while stressing its specific plans remain in development, said cobranded merchandise is a strong possibility both on the tour and elsewhere. 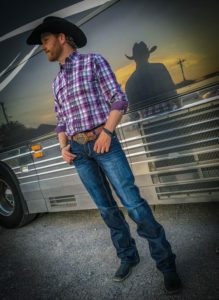 Chancey Williams, the reigning Rocky Mountain Country Music Association Entertainer of the Year, is set to embark on a second summer tour in support of the Rodeo Cold Beer album, which debuted at number 7 on the iTunes Country Albums chart and number 1 on the Billboard Magazine Mountain Heatseekers chart. A new single from the album, “Hair Trigger Heart” is expected next month, along with a new video release. Williams said he and his Younger Brothers Band, long-known for their Wyoming brand of country music, are a natural with CINCH®. “We’ve built our career on authenticity,” the singer stressed, “I could never see us endorsing a product we don’t fully believe in. I wear CINCH® apparel, we see these folks at dozens of the same events, some of their rodeo athletes are some of my best friends. CINCH® is a perfect fit for me,” Williams concluded with a smile.